The 7400 Contest had loads of awesome entries ! My entries Tic Tac Toe won a first place and Mathemagic won a third place ! Thanks a lot to dangerous prototypes for running the contest ! Now for the prizes !!! Tic Tac Toe is now on hackaday! Got my Analog Discovery Kit last week ! Am super exited! Waiting for the parts from Protostack !! Received the parts today! Unfortunately, will be busy for the next two months – All experiments on hold !!!!!! Edit : Here are some pictures! 2. Analog Discovery from Digilent!! First of all thanks to DangerousPrototypes! 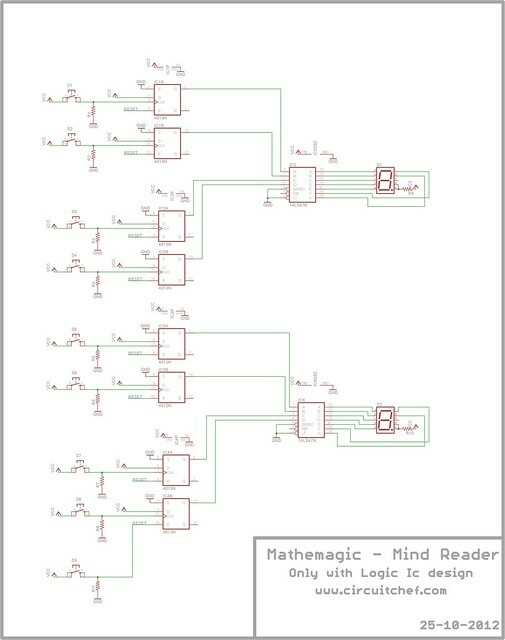 its because of you guys I worked on logic gates after college – else its usually the usual microelectronic stuff! This build is a simple ‘Tic Tac Toe’ game. 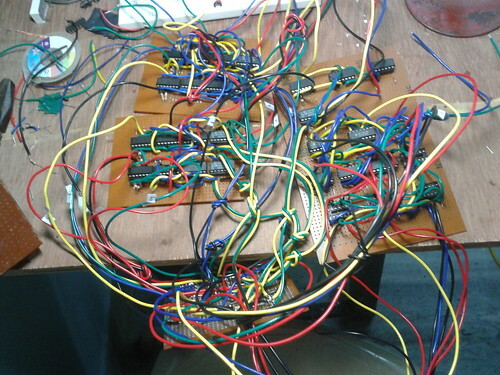 I ended up using 30 Logic ICs ! <PDF alert> This document: Tic_Tac_Toe has all the block diagrams and circuit diagram used. Do leave a comment if you have any queries! PS: The casing is ugly 😛 Trying to build a good case for this project! <Edit> Won a first place in the 7400 contest ! 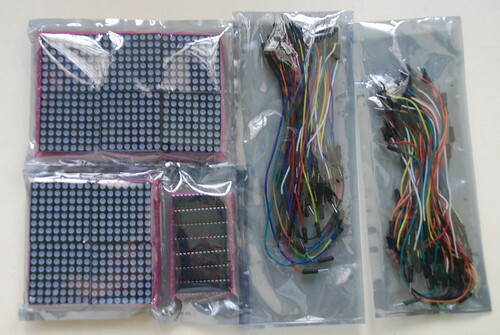 The main aim of this project was to generate a random (Somewhat ) LED blinking using Ic 555. When browsing I came across an article to use Ic4026 to add some amount of randomness, But that was not enough . 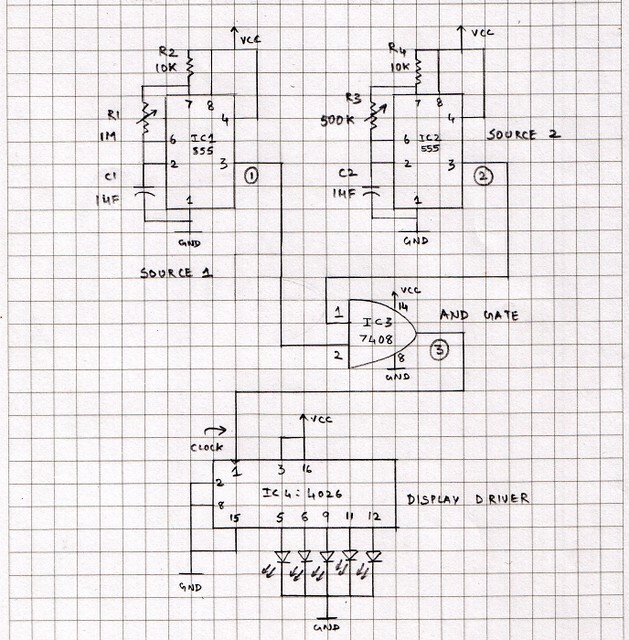 So an AND gate to ‘and’ the outputs from two different astable multivirators (Ic 555 Circuits) and that was given as a clock source for the IC 4026. This made sure that the pattern would not be the same always. One could change the patterns using the two potentiometers (trimmers).These potentiometers ensured that the frequency of the output has changed and thus the clock input to 4026 was altered. 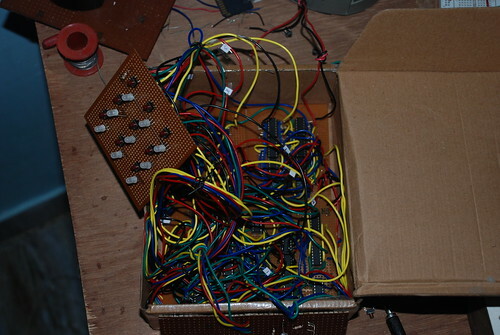 Note : Only five output pins were selected from the set of outputs in a 4026 based on distinct blinking combination. To make the whole setup spin , One small computer cooling fan was taken and a 9V battery was mounted(Glued) onto it ( In the center) . Now the circuit was mounted over the battery. Now when the fan rotated — The battery rotated along with it and so did the circuit — producing beautiful patterns of light.